In spring 1973, Robin Birley, Director of Excavations at Vindolanda Roman Fort, ,just south of Hadrian’s Wall in Northumberland (Northern England), made the greatest discovery of his life; a small fragment of wood which unfolded to reveal ink-marks before the wood went black on exposure to air. It was later shown to be part of a letter sent with socks sandals and underpants. The discovery was made during excavation of deep, damp levels sealed by successive layers of clay in repeated re-buildings .Further excavation in 1974 and 1975 brought the total number of tablets or groups of fragments to over 200, of which more than half had some writing on. Since then, excavation on other parts of the site has revealed many more, and the corpus of Vindolanda Tablets now totals more than 1600. When found the fragile fragments are removed in soil blocks for trench-side excavation ,then placed in water for cleaning, and afterwards immersed in ‘ baths ‘ of methyl alcohol and ether to dry them out, restore their colour and make them easier to read. The tablets have been transcribed and translated by specialist papyrologists Alan Bowman and David Thomas. The tablet above is a letter from Octavius to Candidus concerning supplies of wheat ,Hides and sinews. The Vindolanda Tablets are usually between 1mm and 2mm thick, though sometimes as much as 3mm. They range between 16cm to 20cm and 6cm to 9cm in size; typically, they are about the size of a modern postcard. They are different from wax writing-tablets,inscribed using a metal stylus (examples of both have been found at Vindolanda): These were for temporary records. 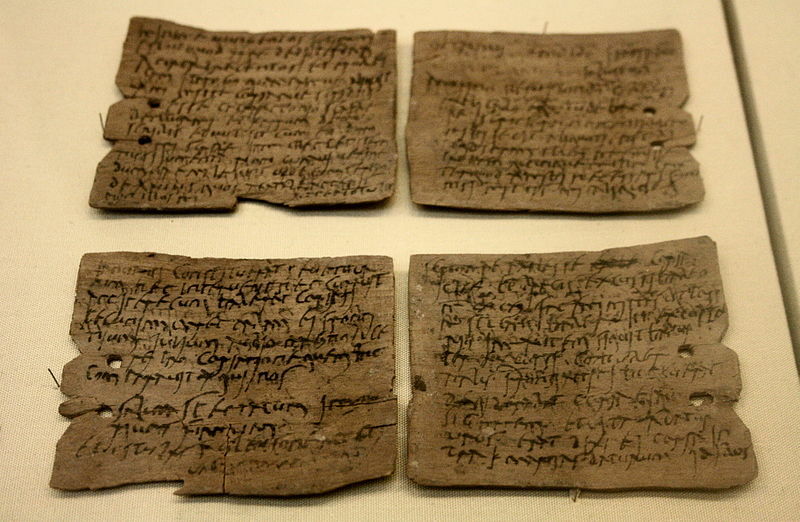 The Vindolanda tablets were designed either for short term records such as inventories or give – aways (e.g.personal letters). Very fine- grained smooth surfaced, they were expressly designed to be inscribed in ink. (Roman pens with iron nibs and inkpots have been found.) A message was written, and the leaf was then folded in half. Sometimes, for longer documents, one or more such leaves might be tied together. The corpus includes records of purchases and supplies ,personal letters of recommendation , reports by NCO’s, requests for leave, and private letters, very often about money matters, others preoccupied with such everyday trivia as birthday parties and the social rounds of the officer class. The great majority of the tablets date from c. AD92-104/105, when the fort was occupied by the Ninth Cohort of Batavians, a part mounted 1,000 strong,” milliary ” auxiliary unit. 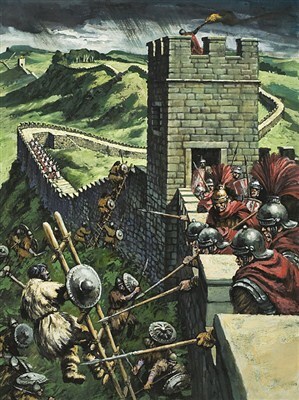 Fort and garrison formed part of a defensive frontier system- the Stanegate Line created during the Roman withdrawal from Scotland between c. AD85 and 105. After the construction of Hadrian’s Wall (AD 121 or 122 onwards) , Vindolanda continued to be used as a military base, remaining in use until the early 5th century AD. The international importance of the Vindolanda Tablets lies in the light they shine on the highly bureaucratized character of the Roman Imperial Army and on the many details of everyday military life. The social gulf between aristocratic officer-class and the many rank-and- file, for example, is revealed by letters referring to the social lives of officers’ wives, in contrast, ordinary soldiers were not allowed to marry (though they had relationships with local women). Aspects of military supply emerge from records which indicate foodstuffs arriving at the fort in a dribble of small consignments, presumably from local farmers. The Roman system of patronage is represented in letters seeking to gain promotions through personal contacts. Through the Vindolanda Tablets we see the economic, social, and military workings of the frontier in the Roman Empire’s golden age. Note:- For those interested. Excavations begin at Vindolanda Monday 1st April to Friday 6th September 2013. I shall look forward to news of more interesting finds hopefully more of the Tablets. Stay Tuned. 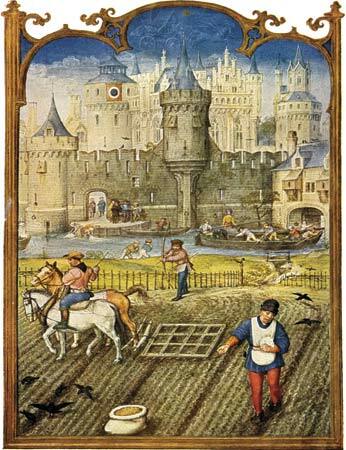 Some thoughts on Food in Medieval England. The Medieval period in Britain was a time of much unrest especially during The War of the Roses in l455,a fierce battle fought to protect the crown. Food however, was as important then as today. 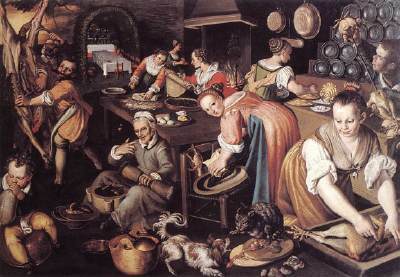 At a feast during these times, all manner of dishes were presented. It was popular to have swan or peacock dressed up as a centre piece for the head table. At each feast, there might be as many as twenty dishes. Other meal choices would be crane, young herons, quail, plover, blackbird and curlew. Most dishes were served with a strong savoury sauce flavoured with spices such as mace, cayenne pepper, cloves and ginger. 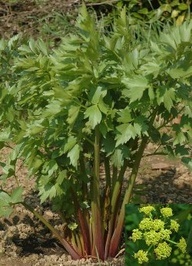 The poorer people lived mostly on pottage which was a broth or stock in which Chopped meat and vegatables were boiled with herbs and often pulses added. 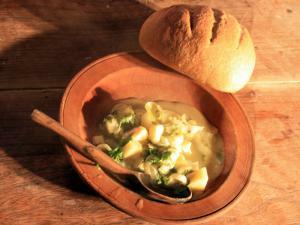 Most people in Medieval England had to make their own food. There were food shops in the towns but most people were peasants who lived in villages where these did not exist . If a villager, you provided for yourself and family and farming was a way of life. The Peasants way of life. Rye and barley produced a dark heavy bread. 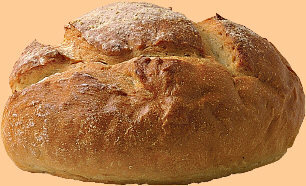 Maslin bread was made from a mixture of rye and wheat flour. After a poor harvest, when grain was in short supply, people were forced to include beans and peas, even acorns. 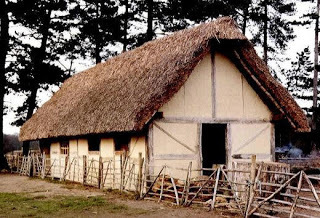 Lords of the manor did not allow peasants on his land to bake their bread in their own homes. All peasants had to pay to use the lords oven. 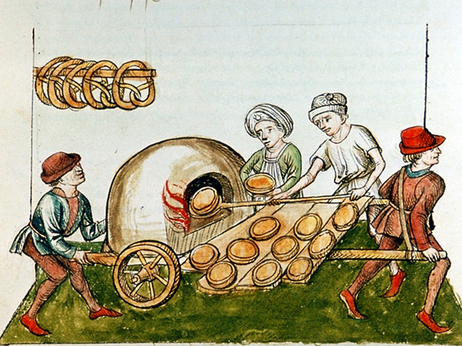 Medieval Pie Baker on wheels. The villagers drank water and milk. The water from a river was unpleasant to drink and the milk did not stay fresh for very long.. The main drink in the medieval village was ale. It was dificult to brew ale and the process took time. Usually the villagers used barley. This had to be soaked for several days in water and then carefully germinated to create malt. After the malt was dried and ground, the brewer added it to hot water for fermentation. The villagers were not allowed to sell their beer unless they had permission from the lord. Fish was as vital as bread to medieval people as everyone had to eat fish for about half the days in the year. This was because the Roman Catholic Church laid down the rule that on Fridays, and until late in the period Saturday and Wednesdays, no one could eat meat. During Lent, eggs and dairy foods were also forbidden. Medieval scene preparing for a fish meal. Because it was almost impossible to transport fish from ports to places inland, large artificial lakes known as “stews” were created so that fresh water fish could be stocked until needed. In Tudor times, deep sea fishing was well established, and fishermen sailed as far as Newfoundland looking for cod. Most of the saltwater fish eaten during this period was preserved by salting, pickling in brine, or sundried. 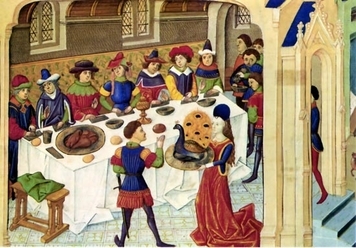 A General idea of meals eaten in Medieval times. BREAKFAST would consist of white bread, Three meat dishes, Three fish dishes( more fish on a saints day and wine or ale to drink. SUPPER This would be very similar to the dinner but with slightly more unusual dishes such as pigeon pie, woodcock and sturgeon. Wine and ale would also be available. SUPPER The main meal was vegatable pottage and if the family was lucky there might be some meat or fish with this meal. Bread would be available and ale to drink. Some Thoughts on Food in Roman Times. The Romans loved their food sweet and savoury,and honey was used in many of their recipes. 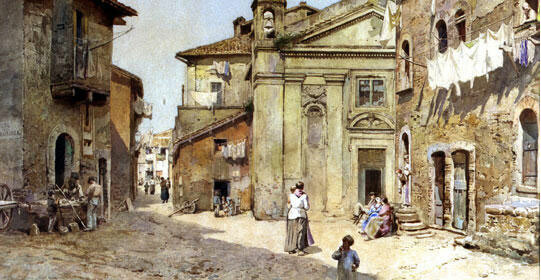 In Rome, of course, bee- keeping was a must and was a highly scientific and important pursuit. Most farms kept bee-hives.It was usual to hand over the care of one’s bees to a man known as an apiarist who would be responsible for the bees. He would most likely prefer to live in his own small cottage so as to be near his bees. The hives needed to be positioned near water and where plants such as thyme,heather,roses, and poppies grew.This position would be for the bees to gather the pollen. The honey was collected three times a year. There is an interesting account by Varro, a famous scholar in Roman times, about two brothers of the Veianus family.On inheriting one acre of land from their father they turned it over to bee-keeping and made their fortunes. As we have seen,the preferred honey of the Romans was thyme honey. In this they differed from today’s bee-keepers who prize heather honey. Neither this variety nor granulated honey was appreciated by the ancients. Pliny states that honey which crystallizes, is poorly rated. Today some specialists prefer the natural granulated form. In ancient Rome honey must indeed have served many purposes, not only for cakes, sweetmeats and sauces, but as a preservative for all kinds of things including meat and fruit. Honey obviously had the same wide use that sugar has today. 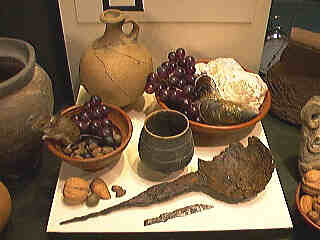 The Romans loved their food extravagantly presented. A banquet might include wild boar or fully feathered peacocks, maybe even a hare dressed with wings to resemble the flying horse Pegasus. Roast pork might be included dressed to appear like geese or fish. Another item might have been all kinds of game bird.. The Romans also were fond of sausages filled with chopped pork,egg yolk, lovage and ginger. When fish was served it had to be absolutely fresh. It was kept in tanks in the dining area ready for instant cooking. 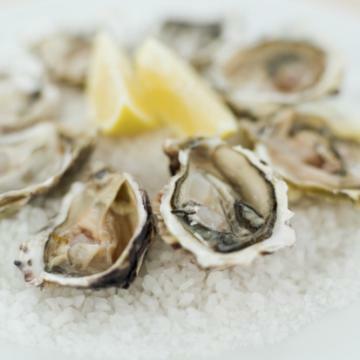 Oysters and snails were extremely popular with the Romans and were cultivated in artificial beds. They were also fond of spicy foods,especially sweet and sour sauces. These sauces contained many herbs such as, pepper,lovage,parsley,mint,bay leaf,cumin,honey and vinigar. The meals for the rich consisted of three courses: a starter such as wild asparagus,salads,mussels,snails and oysters, a special fattened dormouse cooked in a variety of different ways,or cucumber sliced and dressed with penny royal,pepper,grapefruit juice,vinigar and honey. 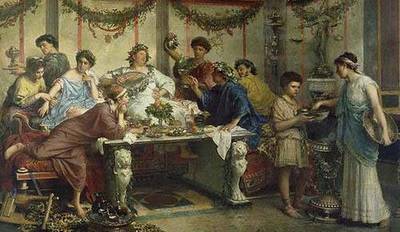 The Main course or prima mensa at a Roman banquet varied in both number and elaborateness of dishes; boiled meat, poultry, game, or other meat dishes would be served. No dish would be complete without Apicius ‘ highly flavoured sauce. 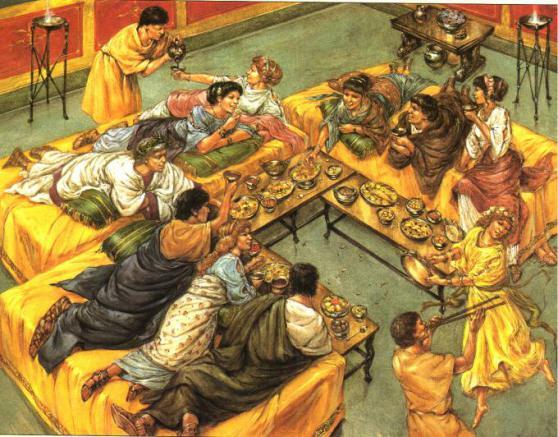 The dining room in which the Romans took their meals was known as triclinium , so called because it was usual to arrange three couches around a central table leaving the fourth side open for the serving slaves. When eating, they wore a fine white napkin around their necks and had another beside them to wipe their fingers after they had washed them in a bowl of water. The meal would be followed by fresh fruit: peaches,plums, apples, grapes, and a variety of nuts. Wine would be drunk throughout the meal. For the poorer people ,life was hard. They could not afford such luxuries. They lived in hovels, and their food consisted of mainly pulmenta, a kind of gruel made from barley and wheat, supplimented by olives, beans, and cheese. 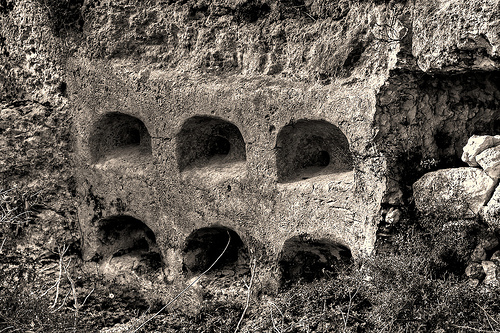 These were the houses of the poorer Roman. My Welsh Leek Sauce Recipe.